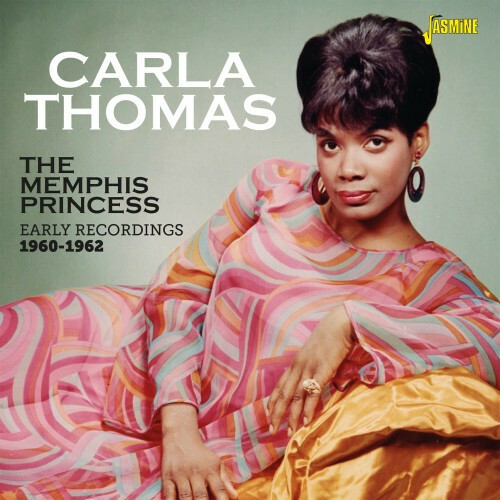 Memphis native Carla Thomas was the first artist to bring success to the fledgling Stax label when her debut solo 45 'Gee Whiz (Look At His Eyes)' broke into the US Hot 100 in late 1960. That record established the teenage Carla - who frequently wrote her own songs as well as performing them - as one of the foremost soul ladies of the whole of that decade, and well into the next one. She was a big star in soul circles, and possibly could have been an even bigger one had she not made her studies a priority over her music career. This new Jasmine collection brings together every recording that Carla made during her formative years as Memphis' Princess Of Soul - her first album in its entirety and in stereo where possible, plus a number of single only tracks and mono single mixes, including four duets with her equally famous father Rufus Thomas. Many of these were also a hit on either the Pop or R&B charts, and frequently on both! Needless to say, as with all Jasmine packages it's beautifully remastered from the best available sources. Carla stopped recording in 1975, but she will always be revered among soul fans for the work she did in helping to make Memphis the epicentre of 60s soul music in the American South. She returned to performing in 2017 and still features many of the songs in this collection in her shows today. Customer evaluation for "The Memphis Princess - Early Recordings 1960-1962 (CD)"